Biomass is transformed into solid & liquid fuels, gas, electricity and heat using a variety of processing methods and equipment. One of the main barriers to a successful biomass energy industry is the simple fact that most raw biomass is not immediately useful as an energy source. For example: Corn cannot be poured directly into a fuel tank. Dairy manure cannot be piped into a cookstove. 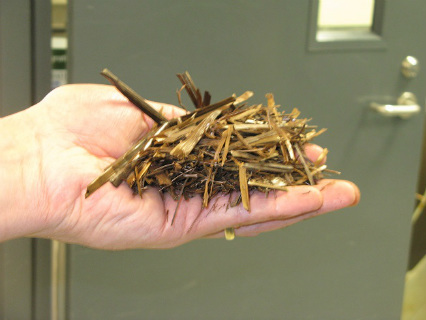 Switchgrass cannot be easily fed into a woodstove. Biofuel crops must be processed in one way or another before they can be a valuable source of energy. Fortunately, the variety of processing methods and equipment is remarkable, allowing us to transform biomass into useful solid fuels, liquid fuels, gases, electricity, heat or mechanical work. 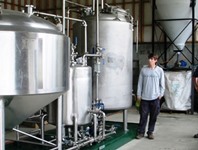 Not all of the processing methods are suitable for on-farm use. Some are very complex, some are very expensive, and others are still in the experimental stage of development. However, many processing methods do have the potential to be used successfully on the farm, or at a small (perhaps cooperative) scale. The different categories of processing methods are listed below – click on the link to learn more about the topic. The names may seem a bit complicated, but it’s often quite straightforward. 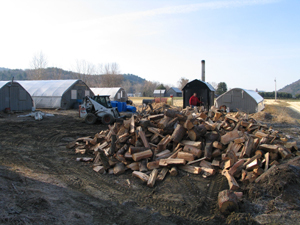 Chopping, grinding, and compacting of biomass are important steps in creating firewood, wood pellets, briquettes, and cellulosic ethanol. Grinding blades. Photo: D. Ciolkosz, Penn State. 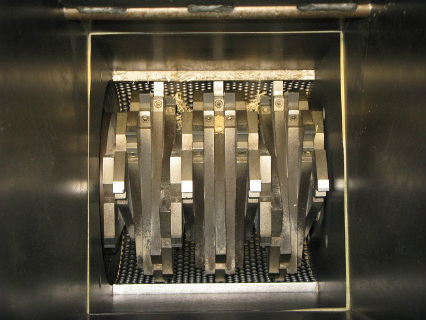 Chippers slice and break biomass into smaller chunks, usually on the order of 70mm (max dimension). The two most common styles are called “drum chippers” and “disk chippers” — named after the shape of the cutting head in the machine. Grinders then slice or pulverize wood or grass into fine pieces, whose maximum size will depend on the design of the machine. Why would you do this? Well, the main reasons for “size reduction” are to 1) make the biomass easier to handle or transport, or 2) increase the reactivity of the biomass (more readily convertible into liquid fuel, heat, or other products). 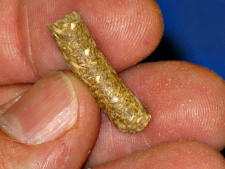 Biomass pellet. Photo: D. Ciolkosz, Penn State. Torrefied Biomass. Photo: Daniel Ciolkosz, Penn State. Have you ever wanted to make your own charcoal? Would you like to run your pickup truck on wood? Thermochemical conversion is the method by which you can turn most any biomass material into solid, liquid, or gaseous fuel, using heat and/or pressure. When biomass is heated up, its molecules break down and rearrange into new configurations. Depending on the conditions under which it is processed, you can end up with any of a variety of fascinating results. Torrefaction uses lower temperatures to modify biomass at the molecular level and make it more suitable as a bioenergy feedstock. Carbonization converts biomass into charcoal, which in turn is used primarily as a cooking fuel. Fast pyrolysis converts biomass into a thick, tarry substance sometimes called “biocrude” or “bio-oil,” a syngas, and biochar. Bio-oil is sometimes “fractionated” into families of compounds/molecules. Further upgrading of the biocrude/fractions is needed to produce final fuels, chemicals and materials. Gasification converts biomass into combustible gas that can then be converted into heat, power, or a variety of substances. 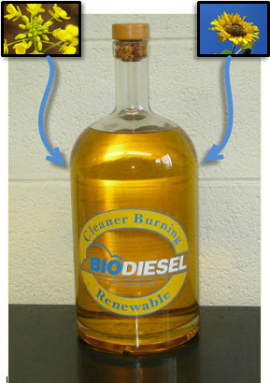 Biodiesel Resources – from feedstock production and conversion processes, to safety and biodiesel quality. Perhaps the oldest use of biomass energy is its combustion for heat. In fact, you might argue that fossil fuels are really just old (very old) biomass. But we’ll set that argument aside for now to talk about using wood and grasses as a combustion fuel to provide heat and/or power. Most of us are familiar with fireplaces and wood stoves that have been in use for generations. However, modern combustion systems are much advanced and are different than those of even a few years ago. Developments in design allow us to use fuel more efficiently and produce fewer air emissions, providing clean and renewable heat to homes, farms, offices, schools, hospitals, businesses,and institutions. Research and development programs at universities, Department of Energy Labs, USDA, and many companies are continuing to make new discoveries and optimize the processes described above. Regardless of the process, renewable energy, chemicals and materials will require biomass feedstocks, and farmers and agricultural enterprises to produce those feedstocks.